Height W/Chain:- 5" & Dia:- 2.5"
We manufacture nautical key chains such as compass, sextant, telescope, binocular, thodolite, canon, magnifying, wheel, anchor, whistle, captain, propeller fan, porthole mirror, telegraph, bell, boatswain pipe whistle, police whistle, bells, navigation light, diving helmet, spirit level, dummpy level & knots etc. We offer a variety of nautical theme Wheel Compass Keyring. Fine compass key chain, made by brass. We are wholesaler & exporter of camping handicraft. We are manufacturer and exporter high quality ker rings with best Price. - Compass Dia:- 5 cm. Nautical antique finish brass Open Face compass With Key Chain amazing style nautical brass compess its shows all direction east, west, north south...Collectible nautical replica vintage marine & maritime brass stylish nuatical compass. 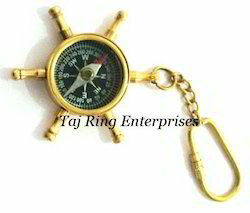 We are remarkable enterprise, involved in offering superior quality Brass Compass Key Chain. From our wide range of products, we offer optimum quality Compass Key Chains. Fabricated using the best quality brass and latest technology, these are designed with high precision in order to meet the international standards. Apart from this, the offered key chains can be availed by clients from us in various sizes, patterns and designs as per their varied demands. 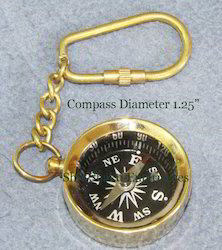 This brass pocket compass convenient size allows for the compass to be taken anywhere. In order to cater to the numerous necessities of the patrons, we have been able to provide a wide range of 1.5 Compass Keychain. We are one of the prominent manufacturers of Compass Key Chain that is widely demanded for its uniqueness and premium quality. Our professionals make use of optimum quality raw materials for making these lightweight and durable compass key chains. The proposed collection is examined for its quality and flawlessness, before the final dispatch. Antique Brass Wheel Compass Key Chain. We are a reputed entity, engaged in offering a qualitative array of Calendar Compass Tower Key Ring.